When the young P T Barnum bid for the Scudder family’s natural history museum in New York, he referred to it as a collection of “stuffed monkey and gander skins.” No doubt his intention was to discourage rival bidders, but it would have been a fair description of most private natural history collections of the time, which was 1841. The remnants of dead animals: how do you make a show of them likely to appeal to anyone other than a fellow collection freak? “Wonderful variety”, as Darwin called it, is a wonderful concept, but when it comes to hundreds of rows of bottles containing assorted coils of beige slime, or thousands of dusty fur corpses with glass-eyed stares, or millions of spiky insect corpses pinned on boards, who really wants to get lost in the wonder of it all? Barnum’s genius was to organise a co-habitation of the stuffed monkey and gander skins with a noisy and vigorous assortment of live creatures and to have the entire ensemble choreographed into a provocative wonder show that set out to confuse the difference between real and fake biological forms. Maria Fernanda Cardoso’s work, with its performative interweaving of live and dead forms, maintains a knowing but detached relation to this tradition. The first works you meet on entry to her new exhibition Zoomorphia at the Museum of Contemporary Art are the Mating Ball (petrified) and the Cardoso Flea Circus (alive and hopping in this video version of the internationally toured show). The first of these is a basketball sized tangle of red-sided garter snakes in plastic replica, accompanied by a curious narrative. In the mating season, the males of this species converge en masse on the females, so that each female becomes surrounded by a writhing ball of would-be mates. Seeking to steal an advantage over their rivals, some of the males secrete female pheromones and so masquerade as females in order to get a place on the inside. But “on close inspection” researchers at the University of Texas have discovered that some of the mating balls contain a counterfeit female and that in 29 out of 42 tests, the impostor was indeed first to reach the genuine females. With its particular scientific credentialling and its improbable imagery, this is just the kind of story Barnum loved to make up. He called it the art of humbug. The narrative could be as fake as the plastic snake bodies, but Cardoso says she never makes up stories. Her genius is to identify natural phenomena that behave like sideshow acts. The fleas in the circus are real. Cardoso feeds them herself, from the blood in her hands and arms. Throughout the action, they are shown in magnified simultaneous projection so that every detail of their minute forms is visible, and at the end of the show, children are invited to watch up close. What the fleas perform, though, is pure human fantasy: high wire acts, high dives, flights across the arena suspended from personal kites. There’s a cross-species joke going on here that belongs quintessentially to circus humour. Of course, height is no problem for fleas. The difficulty is in getting them to imitate human high-wire performances, and so evoke the classic fiction of a world of miniature beings surrounded by miniature artefacts and replicating all the sophistications of the human social world. More sharply disconcerting is a large ring of frogs posed like black-face minstrels, with heads thrown back, hands splayed in front of them and knees bent in wide plié. But they are held together by a wire skewer that passes through their bellies, and they are as dead as the proverbial doornail. If they remind you of a chorus line, they also remind you of all the lovingly tortured small creatures that make up the natural history collections of the world. Cut flowers, impaled grasshoppers, tiny lizards twisted into a crown of thorns, preserved snakes knotted together around a pole they will never climb all contribute to this impression of violated rather than suspended animation. There is violence in the traditions of animal show business as well as those of natural history, but in acknowledging this, Cardoso’s work also maintains an ironic distance from it, displaying above all an affinity with the natural poseurs and tricksters of the animal world. The chickens whose extravagant crests look like the off-track competition on Melbourne Cup day; the red-sided garter transvestites; butterflies that perform sudden disappearing acts through their “uncannily perfect” camouflage techniques. 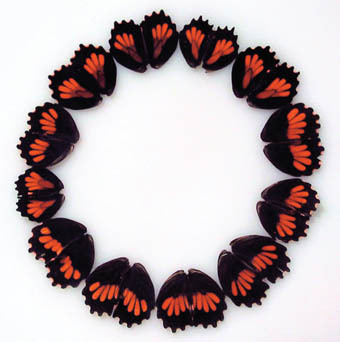 “The vanishing butterflies pose more questions than answers,” says the caption. How come to look dead might be a good thing? Suddenly, one of the common facts of natural behaviour turns into a vortex of speculation.